It is beyond doubt that there has been improvement in the people’s awareness of oral health and utilization of oral health care services over the past few years. However, oral health disparities continue to exist with poor oral health being a routine observation among the marginalized sections and those who are geographically disadvantaged.,, Literature suggests that rural areas are dentally underserved as the existent public health system in India does not integrate dental surgeons as much as it needs to,,; there is urban preference among dental graduates in the establishment of clinical practices.,, In light of these findings, it is important that prospective strategies for promotion of oral health in rural areas and for the marginalized sections of people be seriously considered both by the public administrators and the dental fraternity. Teaching dental institutions play a significant role in the promotion of oral health by reaching out to people through community outreach programs. The Dental Council of India made it imperative for all the teaching dental institutions in India to establish satellite clinics in rural areas, which benefit the people residing in these areas. These clinics address the accessibility issues to a great extent and also offer services at nominal costs. Satellite clinics possess an invaluable potential to implement common risk factor approach, which serves to integrate oral health with the general health of people. Community outreach programs differ from individual care in that they primarily focus on population, including those persons who do not and cannot access care. Evaluation of such initiatives is an intricate and complex task that has been customarily neglected and often underfunded. Evaluation of outreach programs is important as a source of development of good practice, as a guide for making best use of the available resources, and to inform policy development. Thus, evaluation is beneficial not only in curtailing the execution-related issues but also in mitigating the problems pertaining to the formulation of the future programs. In this context, the aim of this study is to evaluate the effectiveness of oral health promotion in one such satellite clinic located in a South Indian university. This cross-sectional study was conducted in a South Indian university located on the Kolkata–Chennai national highway, that spreads over 293 acres. The university has six colleges within the campus, and the student strength of the campus is over 5000. It is a destination university for diverse students from Iran, Iraq, Nepal, Bhutan, Tanzania, Ethiopia, and Libya. The satellite clinic in the campus established by a teaching dental institution provides free oral health services that include screening, prophylaxis, restorations, extractions, and referral services. Ethical approval for the study (133/IEC/SIBAR/2018) was obtained from the Institutional Ethical Committee. The study was conducted between June and August 2018. A two-stage random sampling was performed in which three groups were selected from the seven academic groups at the university (students from each of the six colleges and staff) in the first stage by simple random sampling. In the second stage, a random sample of participants was selected from each chosen group, proportional to the population size of that group. The sampling details of the study are presented in [Figure 1]. The effectiveness of oral health promotion was evaluated based on the perceived unmet dental needs in spite of the free services available. In view of the provision of free oral health services and setup of satellite clinic within the university, it is apparent that accessibility and cost of treatment, the two most common barriers for utilization of dental services, were taken out of the equation in our study. In light of these relatively favorable conditions, beneficiaries are expected to convert their needs to demand, at least the perceived needs if not the normative. A self-administered questionnaire was developed seeking information on the perceived dental needs in the past 12 months, which remained unmet in spite of the above-mentioned favorable circumstances. The expression “perceived unmet needs” refers to these needs, which remained unmet despite perception. The questionnaire also included the self-rated of oral health status and self-rated general health status on a five-point Likert scale. Information was also sought on the utilization of dental services at the satellite clinic. Demographic data were collected on age, gender, and academic group. The questionnaire was administered to all the participants during the working hours of the university. The principal investigator (VCC) made himself available, at the time of administration, for the participants to clarify doubts, should there be any. The questionnaire was readministered to 40 randomly selected participants, after a period of 10 days, with a purpose of correlating the scores on the two occasions. The observed agreement between the responses was found to be considerably greater than the expected agreement by chance, as was assessed by Cohen’s Kappa (0.89). Statistical analysis was performed using IBM SPSS statistics for Windows, Version 20.0 (IBM Corp, Armonk, New York, USA). 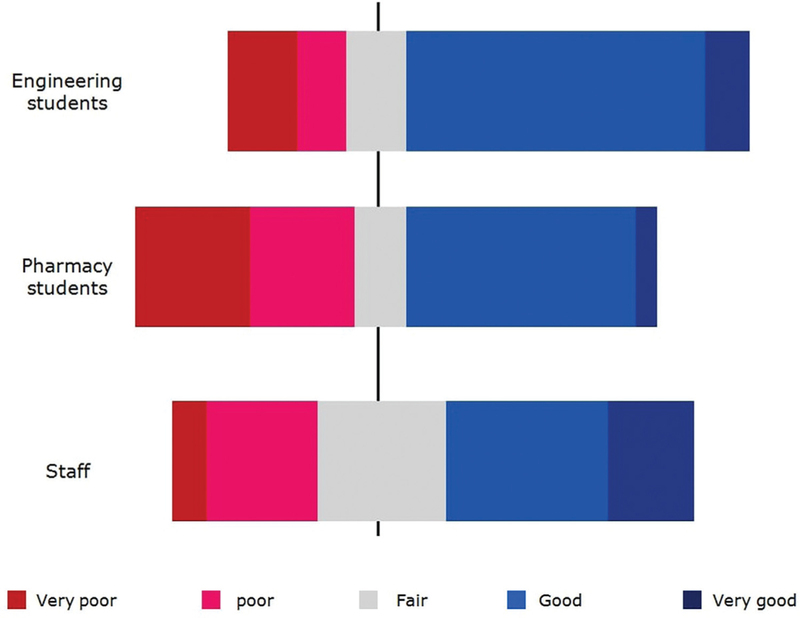 The data on self-rated oral and general health status were dichotomized as “good” (very good/good) and “poor” (fair/poor/very poor) to facilitate in identification of the possible discrepancies between the two measures. Parametric and nonparametric tests were performed as appropriate. The study has been conducted in full accordance with the World Medical Association Declaration of Helsinki (as amended in Edinburgh, 2000). Informed consent was obtained from the principals of the selected colleges and the participants. Sample distribution according to gender, age, self-reported oral and general health status, perceived unmet dental needs in the past year, and utilization of services at the satellite clinic was presented in [Table 1]. Around 80% of the participants belonged to the age group of 16 to 25 years, and the mean age of the study population was 23.19 ± 8.742 years, indicating a considerably wider spread of age among the study participants. Significant differences were observed between the academic groups with regard to self-rated oral health status. The details of the distribution of responses on self-rated oral and general health status on Likert scale are provided in [Figure 2] and [Figure 3], respectively. 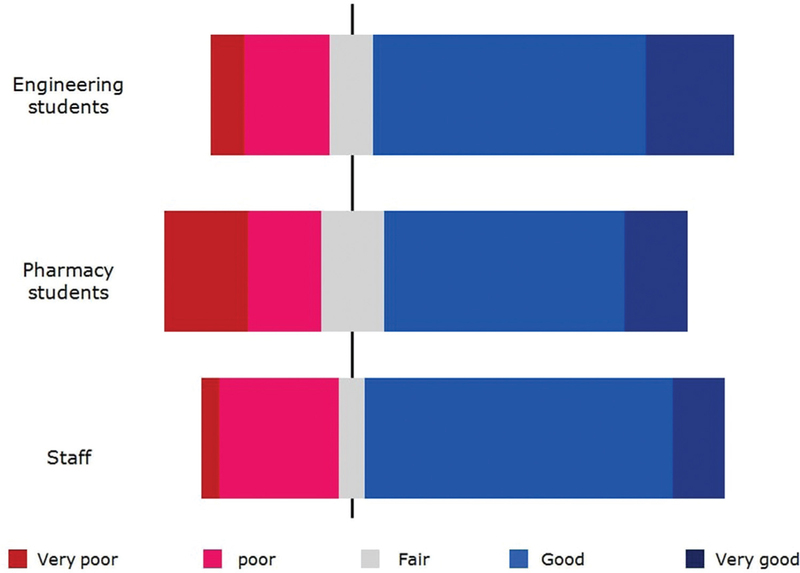 The tendency of the participants to report oral health and general health status toward “good” and “very good” can be clearly observed in these diverging stacked bar diagrams. On dichotomization of Likert responses as aforementioned, it was identified that 40.9% of the respondents reported poor oral health status, whereas only 32.9% reported poor health status. A total of 30.69% of those participants, who reported their health status to be good, rated their oral health status as poor. Spearman correlation test showed significant weak positive correlation (r = 0.226) between the self-rated oral and general health status of the participants (P = 0.000). Nearly 33% of the participants reported having perceived unmet dental needs in the past 12 months. There was no significant difference between the three academic groups with respect to the perceived unmet dental needs in the past year. Among the 100 participants with perceived unmet dental needs, 73 were unaware of the existence of dental satellite center at the university. The common reasons for not utilizing the services at the satellite clinic were lack of knowledge about existence of satellite clinic (60.8%), absence of dental needs (25.61%), poor perception of importance of oral health (9.63%), and lack of confidence in the quality of services offered (1.8%). Only 9.3% of the study population utilized the services at the satellite center. 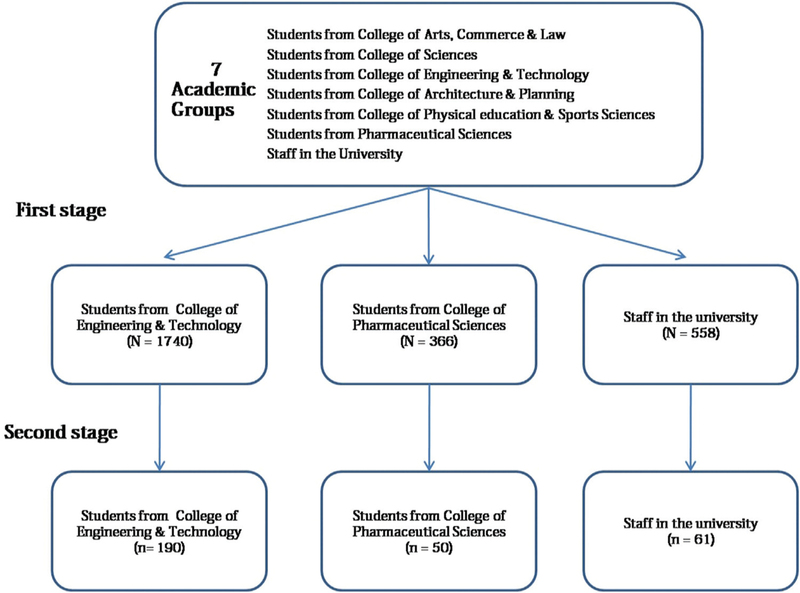 Utilization of available services was significantly higher among staff compared to the students from the two selected colleges (P = 0.012) [[Table 1]]. The percentage of study participants unaware of existence of satellite center was 60.8% (183/301). Promotion of available services was the major suggestion received from the participants (79.4%) followed by provision of oral health education (13.95%). There could be two reasons for the low prevalence of unmet dental need in our study. The participants may have had a dental problem in the past 12 months for which he/she had sought dental care or the classic mismatch between normative need and perceived need may have played a role.,, An important finding in this study is the discrepancy between an individual’s self-rated oral and self-rated general health. More than one-third of the participants with good self-rated general health reported poor oral health. This emphasizes that the campaign “oral health is an integral part of general health” has not been well received by the general population.,,, Care was taken in formatting the questionnaire in such a way that inquiry on self-reported oral health status was reserved to the end, virtually eliminating the scope for respondents to disreckon oral health while responding on perceived health status, which could have happened if these questions were posed in a sequential manner. However, the authors admit that this is too complex a conclusion to draw from a questionnaire study. But the inference opens new avenues and lays foundation for future research in this direction. The utilization of available oral health services was low (9.3%) in the present study. This is comparable with the utilization rates at satellite clinics in Nigeria and the utilization of oral health services in India, in general. A majority of participants were not aware of the existence of the satellite clinic, signifying the need for promotion of the available oral health services, which must be pursued by the dental institutions and the local authorities where the satellite clinics are located. The fact that the care provided by the dental students at this satellite clinic is currently procedure based, where no one student is solely responsible for the execution of the sequential treatment plan unlike comprehensive care, could be a reason for the low utilization observed as the patients may feel disenfranchised with different care providers providing care under the supervision of different faculty members each time they visit. However, this was not explicitly mentioned by any of the participants. Information through patients’ surveys has proven to be a successful way of strategic evaluation and improving the quality of health services. Therefore, suggestions were received from the target population on what could be done to improve the services at the satellite clinic. In light of lack of knowledge about existence of satellite clinic, promotion of available services was the major suggestion received followed by oral health education. To ensure that the rationale and aims of outreach programs are met, health education is necessary. Limitations of this study are seeking dental care through other oral health care resources was not considered, which could have been a reason for nonutilization of services at the satellite center. Clinical evaluation of oral health status of the individuals could have been performed to evaluate the normative need and consequently to determine any mismatch between the perceived and the normative needs. India is a vast geographic extending over 3287,263 km2 and stands at 7th position globally in terms of the geographical area. The number of dental institutions in the country has grown phenomenally over the years, with 313 functioning dental institutions in the country at present. If a policy guideline can be formulated, which mandates each dental institution to establish four satellite clinics at a distance of 15 km covering the entire perimeter of the institution, each institution could cover an area of around 700 km2, providing necessary oral health services for the population residing in that area. This translates to covering an area of around 215,330 km2, when all the dental institutions in the nation are taken into account, which is over 15% of the geographical area of the country. However, this percentage must be interpreted with caution owing to the uneven distribution of dental institutions in the country across its states and clustering of few dental institutions in certain areas, the consequence of which is that such dental institutions does not cover mutually exclusive areas. Therefore, clear policy guidelines on the number of satellite clinics to be established by a dental institution and the distance between satellite clinics and corresponding dental institutions must be established. Guidelines should also include the range of oral health services that must be available in the satellite clinics in view of the fact that a great proportion of oral health care provided at satellite clinics constitute tooth extractions. Special emphasis must be placed on methods and strategies for oral cancer diagnosis while formulating policy guidelines, as the incidence of oral cancer in India has been on a constant rise. The role of satellite clinics in habit cessation counseling must also be established. Guidelines must ensure periodic evaluation of satellite clinics both in terms of improvement in oral health status of corresponding populations and the improvement in diagnostic and clinical competence of dental students. Evaluation of satellite clinics both from the dental students’ perspective and with regard to oral health status of concerned populations must be seriously undertaken, as periodic evaluation and critical appraisal are as important as the formulation and execution of oral health promotion programs. Kakde S, Bedi R, Verma M. Oral health inequalities: A call for action to improve oral health in India. Int Dent J 2013;63:324-8. Dhingra K, Kharbanda OP. Oral health inequality in India: Perspectives and solutions. Oral health inequalities and health systems in Asia Pacific (special issue). Nature India; March 2017. Available at: https://www.natureasia.com/en/nindia/article/10.1038/nindia.2017.29. [Last accessed on November 8, 2018]. Mathur MR, Singh A, Watt R. Addressing inequalities in oral health in India: Need for skill mix in the dental workforce. J Family Med Prim Care 2015;4:200-2. Simon AK, Rao A, Rajesh G, Shenoy R, Pai MB. Oral health care availability in health centers of Mangalore Taluk, India. Indian J Community Med 2014;39:218-22. Vashist A, Parhar S, Gambhir RS, Sohi RK, Talwar PS. Status of governmental oral health care delivery system in Haryana, India. J Family Med Prim Care 2016;5:547-52. Gambhir RS, Kaur A, Singh A, Sandhu AR, Dhaliwal AP. Dental public health in India: An insight. J Family Med Prim Care 2016;5:747-51. Rao KD, Shahrawat R, Bhatnagar A. Composition and distribution of the health workforce in India: Estimates based on data from the National Sample Survey. WHO South-East Asia J Public Health 2016;5:133–40. Kothia NR, Bommireddy VS, Devaki T, Vinnakota NR, Ravoori S, Sanikommu S et al. Assessment of the status of National Oral Health Policy in India. Int J Health Policy Manag 2015;4:575-81. Sandhu K, Kruger E, Tennant M. Dental schools in the Republic of India: A geographic and population analysis of their distribution. Int J Oral Health Sci 2014;4:13-7. Chandu VC, Pachava S, Viswanath V. Strategies for improving accessibility to oral health care services in rural India: An insight. Int J Oral Health Med Res 2017;4:44-6. Dental Council of India. Creation of setup of satellite clinics in remote areas for internship compulsory requirement of the DCI revised BDS course (3rd amendment) Regulations, 2011. Letter No. DE-130-2012/A-3381, August 30, 2012. Watt RG, Harnett R, Daly B, Fuller SS, Kay E, Morgan A et al. Evaluating oral health promotion: Need for quality outcome measures. Community Dent Oral Epidemiol 2006;34:11-7. Watt R, Fuller S, Harnett R, Treasure E, Stillman-Lowe C. Oral health promotion evaluation—Time for development. Community Dent Oral Epidemiol 2001;29:161-6. Cohen LK. Converting unmet need for care to effective demand. Int Dent J 1987;37:114-6. Gilbert GH, Helft MN, Duncan RP, Ringelberg ML. Perceived need for dental care in dentate older adults. Int Dent J 1994;44:145-52. Reisine ST, Baillit HL. Clinical oral health status and adult perceptions of oral health. Soc Sci Med 1980;14A:597-605. Martins AM, Barreto SM, Pordeus IA. Factors associated to self-perceived need of dental care among Brazilian elderly. Rev Saúde Pública 2008;42:e1-9. Petersen PE. Global policy for improvement of oral health in the 21st century—Implications to oral health research of World Health Assembly 2007, World Health Organization. Community Dent Oral Epidemiol 2009;37:1-8. Glick M, Monteiro da Silva O, Seeberger GK, Xu T, Pucca G, Williams DM et al. FDI Vision 2020: Shaping the future of oral health. Int Dent J 2012;62:278-91. American Association for World Health. World Health Day 1994 resource booklet. Washington, DC: American Association for World Health; 1994. Okeigbemen SA, Nnawuihe CU. Oral health trends and service utilization at a rural outreach dental clinic, Udo, Southern Nigeria. 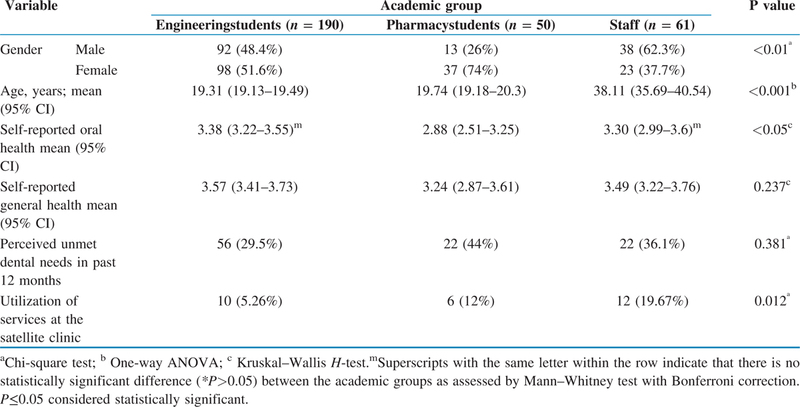 J Int Soc Prev Community Dent 2015;5:118-22. Christie D, Maida CA, Freed JR, Marcus M. Identifying and responding to competing ne eds A case study of a dental school operated community dental clinic. J Dent Educ 2003;67:1243-51. Al Hussyeen AJ. Factors affecting utilization of dental health services and satisfaction among adolescent females in Riyadh City. Saudi Dent J 2010;22:19-25. Meade CD, Menard J, Martinez D, Calvo A. Impacting health disparities through community outreach: Utilizing the CLEAN (Culture, Literacy, Education, Assessment, and Networking). Cancer Control 2007;14:70-7. Watt RG, Harnett R, Daly B, Fuller SS, Kay E, Morgan A et al. Oral health promotion evaluation toolkit. Community Dent Oral Epidemiol 2004;32:395-6. Mofidi M, Strauss R, Pitner LL, Sandler ES. Dental students’ reflections on their community-based experiences: The use of critical incidents. J Dent Educ 2003;67:515-23. DeCastro JE, Matheson PB, Panagakos FS, Stewart DC, Feldman CA. Alumni perspectives on community-based and traditional curricula. J Dent Educ 2003;67:418-26. Woronuk JI, Pinchbeck YJ, Walter MH. University of Alberta dental students’ outreach clinical experience: An evaluation of the program. J Can Dent Assoc 2004;70:233-6.